One regret I have was not asking Fr. Joe Dizon to be our wedding priest. So when my wife gave birth to our second child last September, we talked about asking ‘Padz’ to officiate her christening. But that will happen no more. Last November 4, Padz passed away. He was 65 years old. I best remember Padz as pilyo. And his priestly kapilyuhan endeared him to me, and I guess to many others as well who have known him and worked with him. One time he told me how a former congresswoman from a party-list group made ‘mano’ to him when he was at the House of Representatives. “Kinilabutan ako. Parang gusto kong batukan.” The former congresswoman was then parroting the red baiting propaganda of the military, which had victimized many of Padz’s colleagues and friends. Padz still did his priestly task and gave his hand, while the batukan happened only in his mind, he said, grinning. Like a regular buddy, Padz was game. He doesn’t mind when we tease him every time he uses a magnifying glass when reading a text message. At one press conference which he attended despite being on a wheelchair, we jokingly asked him to stand up for the photo op. As always, he responded with a boyish grin. I first met Padz about 12 years ago in a conference in Bangkok about workers and globalization. It was my first time abroad and was excited to see around and buy pasalubong. He volunteered to accompany me; he was still able to walk briskly back then. When we were buying some souvenir stuff, he asked the vendor for more than half the price of the item. “Nakakahiya namang tumawad itong paring ito,” I said to myself. But to my amazement, Padz eventually got it at a 50% discount! “Ganito dito,” he simply said. That was the first lesson I learned from him. In the next couple of years I would see him occasionally; when we were both invited as speakers in some forums or when he asked Ibon to give inputs on current issues at the Workers’ Assistance Center (WAC) in Imus, Cavite. When I moved to Bayan, I saw him more often. Almost always, he would remind me of my smoking. “Tigilan mo na yan,” he would say. The last time I saw Padz was just after the Sona last July. There was a small ‘seminar’ on detox diet which we both attended. “Mas masarap pa rin ang crispy pata kesa singkamas,” he whispered to me at one point during the seminar. Padz loved food. His genuine warmth and affection are matched only by his firmness in his advocacies and resolve to fight for social justice and genuine change. Padz was the face of poll watchdog Kontra Daya and in the past two elections was a fixture at protest actions in front of the Comelec main office in Manila. At one of the rallies, Comelec security personnel prevented Padz and other Kontra Daya leaders from entering the building to deliver a letter to the Commissioners. There were shoving and pushing and Padz was at the frontline. I was worried for him, being aware of his health condition. But there he was — a copy of the Kontra Daya letter in his hand, undeterred by the Comelec security people and his own physical limitations. To be sure, that was a minor incident. Those who had known him since the Martial Law years certainly have much better stories of how Padz displayed courage in the face of far greater adversity. But it was an occasion that allowed me to have a glimpse of and see up close the priest and the activist, deteriorating health and all. I admired him even more. Padz was an activist who was devoted to his vocation, and a priest who was committed to his activism. 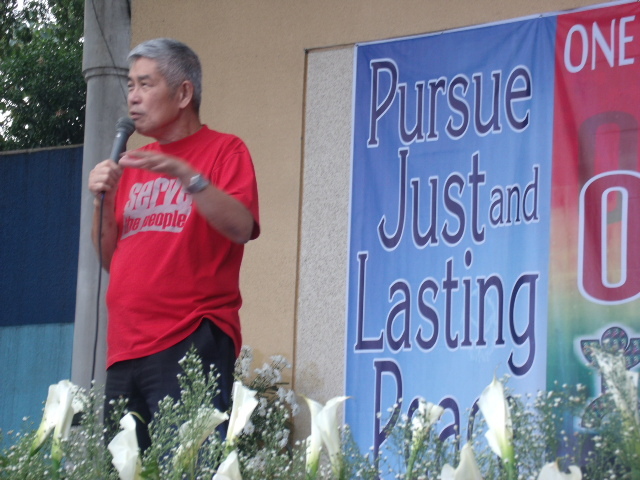 This made him effective in building alliances to advance the interest of the poor and oppressed people – the workers, farmers, fisherfolk, urban poor and others – that he has faithfully served in the past 40 years as a priest. I’ve seen him preside over meetings of disparate groups that would otherwise not sit together in a table to discuss common activities. And he did it very well and very effectively. He patiently hammered out unities while being firm in the political position he represents. No wonder that Padz, and the national democratic movement to which he belongs, figured prominently in many of the broadest and most important political alliances in the country. His sudden demise hasn’t sunk yet to me, not even after attending the tribute for him by the people’s organizations he worked with and hearing the eulogies that honored his life as a priest of the people and as an activist of the national democratic movement. I wanted to feel the grief and pain but only his youthful grin and dry humor remain. Maybe because the meaningful way he lived his life and selflessly shared it to the poor and oppressed have filled me up to the brim that I could hardly feel the loss even now when Padz is already gone. Padz may not have a statue or image like the Saints of his Church. But his is firmly built in the hearts of the people who will wage on the fight to build a society that is truly just and free.